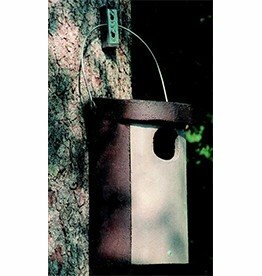 The Schwegler Nest Box 1BFN is a lightweight box originally developed for Lesser Kestrels. However it is equally popular with other species. The design allows for easy installation in walls, cliffs, etc. The Schwegler 1BFN includes a platform below the entrance hole for convenient access. Siting: at least 4 m above the ground. Please ensure unobstructed access for birds entering and leaving the box. Suitable for: Lesser Kestrel, Little Owl, Scops Owl, Hoopoe, Roller, Jackdaw, Starling, Spotless Starling. Internal dimensions: approx. 18 x 18 x 30 cm. External dimensions: approx. 19 x 19 x 34 cm. Diameter of entrance hole: 65 mm. Positioning: on external walls of buildings of all kind, including churches and industrial buildings, poles, etc. The 1BFN is mostly built into external walls. Cleaning: The box can be easily accessed using the inspection flap at the rear. Material: Plant fibre (100% asbestos-free) and Sschwegler wood-concrete. Suitable for: Tawny Owl, Stock Dove, Jackdaw, and in some areas, Goosander and Goldeneye too. 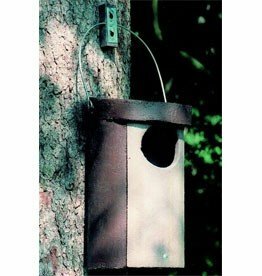 Owl boxes are installed in parks and forests not only to promote the diversity of species but also as a means of controlling the mouse population.